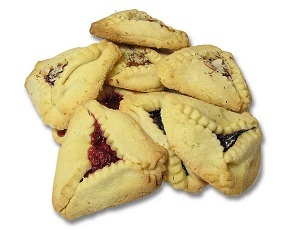 *The hamantashen is the classic purim cookie, served in every classroom party across Israel. In theory, the idea of the cookie is a little gross. The cookie’s three-cornered shape represents Haman’s clipped ears. Move past the fact that a poppy-seed filling seems like the ear hair (YIKES) and these cookies are a wonderful treat and a fun activity for Purim. Hint: If you don’t have time to make this cookie dough you can use store bought sugar cookie dough and filling…the trick is just making the triangle cookie. Suggested fillings: A can of poppy seed filling is the traditional filling but you can use any filling like nutella, prune butter, strawberry jam, apricot preserves, cherry or blueberry pie filling. 1) Preheat oven to 350 degrees and grease your cookie sheet. 2) Sift all the dry ingredients togther. 3) In a seperate bowl cream the sugar, oil and shortening. Stir in 3 eggs, one at a time, vanilla, and the orange juice. 5) Roll dough into a ball and refrigerate for one hour so it is easier to roll out. 6) Divide the dough into four parts. 7) Roll out each piece on a lightly floured surface. 8) With the rim of a glass or cookie cutter cut the dough into 3 inch circles. Place the circles on the cookie sheet. 9) Place less than a teaspoon of the filling of your choice in the middle of each circle (not too much or it will leak out). 10) Fold the three sides of the circle to the center to make a triangle. Pinch the sides to cover as much as the filling as possible. 11) Brush dough with beaten egg for glaze and sprinkle with sugar. 12) Bake for 20 minutes in preheated oven until golden brown.